The best view of Helsinki opens upon arrival by boat: it is view of a white, fresh city full of expectations. Restaurant Saaristo, located on the Klippan island in front of South Harbour, offers this same view and atmosphere for your enjoyment. At Saaristo history breaths life on all surroundings. You can admire the Empire-Helsinki skyline in the north, the ingenious walls and bastions of the Suomenlinna fortress in the south and the crafty and romantic Art Nouveau style wood cuts in the historical dining room. Saaristo’s white Art Nouveau style villa, built in 1898, is one of Helsinki’s most imposing and traditional restaurants. Saaristo's historical milieu offers unique surroundings from romantic dinners for two to private parties of 400 persons. The restaurant has a large dining room with stunning sea views, a bar, a dance floor and three outdoor terraces. Upstairs there are also two meeting rooms, which can be booked in May and June for meeting groups of max 16 persons. 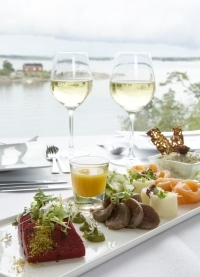 Restaurant Saaristo's menu offers the best delicacies of Scandinavian cuisine. During crayfish season Saaristo is also one of the most popular venues in town for Finnish crayfish parties. In Saaristo delicious Finnish crayfish are served from 22. July until end of September. Both the building and the restaurant have a vivid and long history. This restaurant has been the scene for many crayfish season festivities with their schnapps songs, multiple wedding waltzes and business parties. For Eino Leino, the Finnish poet, this was the ultimate place to celebrate Vappu, First of May. There are many memories and stories to choose from. Your visit to Saaristo will be a part of this continuum of over a hundred years. We wish that your visit will become a tradition and many wonderful memories will remain with you. A connection boat serves the island every 20 minutes (full hour, 20 past and 20 to) from the Saaristo's pier located south of the South Harbour's Olympia terminal, next to the Peace Statue (street Ehrenströmintie). The short boat ride takes only a couple of minutes. The boat fee will automatically be added to your restaurant bill. We'll open 1st of May 2015. We open again 1. May 2015.